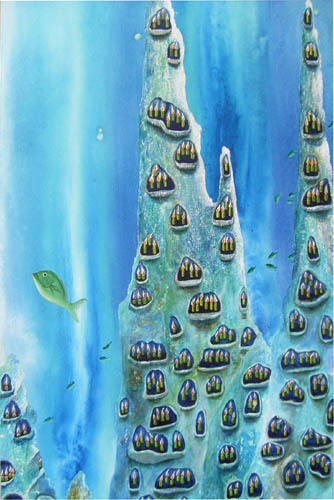 Image: "353 candles", by Nathalie Haymann. The painting is no 36/36 from a series about the sinking of SIEV-X on October 19, 2001, when 353 asylum seekers enroute to Australia drowned as their boat sank. More than 100 refugees sailed to Australia, but they never arrived. Did the government know? On October 2, 2009, a boat with 105 refugees sailed from an unknown Indonesian port to Australia. One of the passengers, Mirza Hussain Jaffari, phoned his family in New York to let them know 'they were on their way now'. Nothing more was heard of Mirza, or from anyone else on board. Over the next couple of weeks, then months, we started receiving phone calls from Afghanistan, Pakistan, Indonesia and New York, and slowly a picture emerged; a picture that remained incomplete and a puzzle with most pieces missing. We heard from the families of Mirza and Mr Heidari (below), we brought them in contact with reporters in Australia and Indonesia - but we acknowledged there was not much we could do in addition to ensure reportage of the little bits we knew. This page brings together the collection of news items about the October 2 2010 boat that did not arrive. It was presumed to have had between 102 and 105 passengers on board, mainly of Hazara ethnicity. The voyage was unfinished, and the story was incomplete for many months. That remained the case until a Senate Inquiry threw up some answers. Then Sun Herald reporter Nathalie O'Brien started digging, and uncovered hidden goings-on in Customs and Border Protection. It took more than two years for the Immigration Department and its Customs and Border Protection agency to confirm what they had known all along, since before 12 noon on the second day the boat sailed from its Indonesian departure point. Here is the timeline. Jan 19, 2010 A spokesman for Immigration Minister Chris Evans yesterday said the government was not aware of a boat having sunk in Australian waters. Febr 5, 2010 A spokesman for the Federal Government says there's no evidence that a boatload of more than 100 people left Indonesia on or about October the 2nd and he says it's only speculation that a vessel sank. May 25, 2010 The boat left Indonesia on October 2. Australian authorities learnt a vessel was in distress the next day but Home Affairs Minister Brendan O'Connor said ''credible information'' showed its difficulties had been resolved. May 26, 2010 [It] never reached Australia's search and rescue waters and contact was not made with the boat directly. In that instance, Customs says it did "everything it could possibly and reasonably do". That people-smuggling venture left Indonesia with more than 100 asylum seekers and was unusually large. "I can't be sure what happened. The boat might have gone back to Indonesia, it might have sank,"
...authorities had "credible information" the boat set out for Australia from Indonesia about October 2 last year. "The intelligence did suggest that the vessel, if it existed, was making its way to Christmas Island," he said. "So we did conduct surveillance sweeps of the approach to Christmas Island . . . but it did not arrive." Sept 11 2011 A distress call giving out the co-ordinates of a stricken boat carrying 105 Hazaras seeking asylum ... was received by Customs ...but the agency has never publicly revealed the details. Advice that the vessel was in distress and its position in seas between Indonesia and Australia on October 3, 2009, was passed by the agency to the Australian Maritime Safety Authority (AMSA). Customs has never revealed whether the distress call came from the stricken vessel or from another source. [Answered] questions in Parliament in May ... reveal it was not until a story about the missing boat was published three months later, on January 18, 2010, that Customs and Border Protection "reviewed its information holdings" and found the data. Sept 18 2011 ...in an answer to a question on notice this month, [Customs] revealed that the co-ordinates of the boat had been passed to AMSA. Customs has told The Sun-Herald that it would not reveal how it knew the boat was in distress for "operational" and "intelligence" reasons. Feb 16, 2012 An asylum-seeker boat that is believed to have sunk, drowning 105 Hazaras on board, was left floundering and ''taking on water'' for almost four hours before Australian authorities activated a rescue mission. ...red tape was the reason for the delay in relaying the distressed boat's co-ordinates to Australia's sea rescue agency. But a new timeline of events obtained by the Herald under freedom of information laws revealed that was not the case. The heavily-redacted documents show the government had been tracking the vessel as it left Indonesia and had known before 12pm on October 3, 2009 that the boat was in trouble. It was not until 3.33pm that day, according to the documents, that Border Protection told Maritime Safety about the distress situation and released the boat's co-ordinates. In estimates hearings on Tuesday, the deputy chief executive of Border Enforcement, Marion Grant, corrected the parliamentary record when she revealed the agency had not acted immediately to send help to the boat. 30 December 2010: Another asylum seeker boat went missing; or had it arrived? - We were very wrong about an 'arrived' yet vanished boat. During the December 2010 Christmas weekend, two newspapers broke the news that a boat with asylum seekers was feared missing. We didn't believe them. Sadly, we were very wrong. Grave fears are held for 102 asylum seekers who never arrived in Australian waters after setting off on a boat in Indonesia in October last year. WA human rights group Project SafeCom said friends and family members have not heard from any of the boat people since they departed. "We have been informed that amongst the passengers nobody has heard from since their presumed departure, are Hazaras from Afghanistan, including a brother of a young Hazara refugee in Brisbane," Project SafeCom spokesman Jack Smit stated. "Queensland Hazara community member Hassan Ghulam started receiving messages about the missing boat a few weeks ago and he shares our concern." "Mr Ghulam has told Project SafeCom that community members have travelled to Indonesia on a fact-finding mission, and that they have even contacted sources in Pakistan, but they have been unsuccessful in getting any information about the welfare of the passengers or news of the boat and what happened during the voyage. "We need to know what happened to this boat and what happened during this voyage," Mr Smit said. "If it was monitored by Indonesia on behalf of the Australian government, we need to know whether it was intercepted by Indonesian authorities. "Conversely, if its voyage was monitored in Australian waters by Australian maritime and border protection authorities, we need to know what happened to the boat. If the boat perished, we need to hear that from the authorities." Mr Smit said the Rudd government was diligent when reporting about boat arrivals and it should do the same when something goes wrong. "We absolutely expect the same rigorous compliance in reporting when something goes wrong with a vessel. "No political pain and rancour for the Rudd government would ever justify burying information and maintaining silence and secrecy around a boatload of asylum seekers heading for Australia that perishes," Mr Smit said. A boatload of asylum seekers believed to have set off from Indonesian waters for Australia in October has never arrived, the Afghani refugee community says. Brisbane-based Hassan Ghulam said worried relatives of 105 ethnic Hazaras believed to have left Indonesia on October 2 had started contacting him weeks ago. Hazara are a Persian-speaking ethnic group who live mainly in the central region of Afghanistan. "A young gentleman, he had a brother on that boat, he contacted me (saying) that the boat departed Indonesia on October 2 with 105 Hazaras on it," Mr Ghulam said. "He asked if I had heard anything on the arrivals because he had had no news for quite some time." Mr Ghulam said other Australian-based Hazaras who had learnt that their relatives were on the boat had become anxious. Checks with the Department of Immigration and Customs and Border Protection had revealed nothing about the fate of the boat or those on board, Mr Ghulam said. Contacts of the men had travelled to Indonesia and checked detention centres but had found no sign of them, he said. "There was no news at all. The gentleman contacted me again and he had no news," Mr Ghulam said. "He told me there were people who made inquiries, travelled to Indonesia, checked the detention centres et cetera and there is no sign of the 105 people." Jack Smit of human rights group Project SafeCom Inc said it was important to know what happened to the boat and what happened during the voyage. "If it was monitored by Indonesia on behalf of the Australian government, we need to know whether it was intercepted by Indonesian authorities," Mr Smit said. A Department of Immigration spokeswoman said the department could not reveal the identities of asylum seekers being processed for their own protection. But asylum seekers are granted access to telephones to contact their families on arrival, she said. SYDNEY (Reuters) - More than 100 Afghan asylum-seekers who left Indonesia by boat for Australia three months ago have not been heard from and are assumed to have been lost at sea, refugee activists said on Sunday. The boat is one of many that left Indonesia for Australia in 2009 bringing hundreds of asylum-seekers, mainly from war-ravaged countries like Iraq, Afghanistan and Sri Lanka. It has left Australia's processing facility on Christmas Island in the Indian Ocean struggling to cope. Critics have blamed a soft stance on asylum-seekers by Australia's Labor government for the influx. Relatives in Australia have heard no news from the 105 ethnic Hazaras who left Indonesia on October 2 in a voyage organized by a people-smuggling syndicate, activist Hassan Ghulam told Reuters. Three Indonesian crew were also aboard. Ghulam said he had contacted Australian immigration and border protection authorities but they had given no information. Australia receives a fraction of what the United Nations estimates to be around 15 million refugees globally, but the issue divides Australian voters and has the potential to dent Prime Minister Kevin Rudd's high popularity in opinion polls. Members of the Afghan community in Brisbane believe women and children were among 105 people on a boat which they fear has sunk after leaving Indonesia for Australia on October 2. However, a spokesman for Immigration and Acting Home Affairs Minister Chris Evans yesterday said the government was not aware of a boat having sunk in Australian waters. "If people have information that a boat has sunk, we urge them to contact the Australian Maritime Safety Authority," the spokesman said. Hazara community spokesman Hassan Ghulam, of Brisbane, said he'd been told by detainees on Christmas Island that four families, including children, were on the boat which may have sunk in Indonesian, international or Australian waters. Mr Ghulam said a 25-year-old Hazara man, Barkat Ali, was believed to be on board the boat and concerns were raised by the man's brother, who lives in Brisbane. "There are people who are related to these 105 people but they are not coming forward because they are afraid of being accused of encouraging their family to make this journey, but this is truly not the case," he said. He said checks with the Department of Immigration, and Customs and Border Protection, had revealed nothing. Meanwhile, the opposition said the government must reveal what it planned to do with five Sri Lankan asylum-seekers on Christmas Island who were declared by ASIO as security risks. The Australian revealed this month that four of the Tamil refugees picked up by the Customs vessel Oceanic Viking had been issued adverse security assessments, making them ineligible for visas. One of those was a woman who travelled to Australia with her two young children. Her husband, who travelled to Australia by boat some months ago, was also refused a visa on security grounds. Coalition immigration spokesman Scott Morrison said other countries would be well aware that the four men and a woman now carried that stamp and they'd be reluctant to accept them. "The simple fact is they will find it exceedingly difficult to settle these people somewhere else now that our security agency has said they are a security threat." Senator Evans said that the family would not be issued any type of visa. "We're determined that these people be resettled elsewhere," he said. The government conceded it may take some time to find a third country willing to take the five. A spokesman for Senator Evans said that to protect Australia, those who received adverse findings would be held on Christmas Island while Australia explored options for their future relocation or they departed voluntarily. PETER CAVE: The family of an Afghan man who's gone missing en route to Australia have called on the Federal Government to find out what may have happened to him. The family fears that Mirza Hussain Jaffari was on a boat which may have sunk after leaving Indonesia in October. Last month, members of the Afghan community in Brisbane expressed concern about the vessel, which they think had more than 100 people on board. But the Australian Government says it knows nothing about the boat. DAVID WEBER: In early October, Mirza Hussain Jaffari apparently called his family from Indonesia, saying he was on a boat about to head towards Australia. He said 107 people were on the boat, which was new. Mirza Hussain Jaffari's cousin, Jaffar Hussain, is speaking from Afghanistan. JAFFAR HUSSAIN: Mirza Hussain Jaffari spoke to his family in early October, probably the 2nd of October at midnight when he last time called his family and said that he's now leaving for Australia by boat. DAVID WEBER: He did not say where he was leaving from? JAFFAR HUSSAIN: No he did not mention about the place he was leaving from because he was, maybe he didn't thought it necessary because his family doesn't know about Indonesia at all. He said that there are other Hazaras, other Afghans, who are on board. DAVID WEBER: Why did Mirza Hussain Jaffari leave Afghanistan? JAFFAR HUSSAIN: There are various reasons. The first thing is really security and political instability in Afghanistan. These village has been under attack for the last three years by Taliban-supported Kuchi tribes. DAVID WEBER: Does he have a wife and children? JAFFAR HUSSAIN: No he does not have a wife and children. He has a mother, three sisters, one younger brother. DAVID WEBER: So it was a big decision for him to go because he had people relying on him in Afghanistan? JAFFAR HUSSAIN: Yes it was a very difficult decision for him and we also don't know how he paid thousands of dollars to smugglers to take him to Australia. Where did he find it from? Maybe he sold a part of his land or something. DAVID WEBER: Mr Hussain has called on the Australian Government to hold an investigation, and release any information it may have. JAFFAR HUSSAIN: If they are in the custody of the Australian Government, if they are held in any detention centres, the families have not heard from their relatives for last three months and they are very much concerned and worried. If the Australian Government does not have any information about the boat, we appeal from the Government of Australia to contact the authorities in Indonesia and start a search and rescue operation for them. DAVID WEBER: A spokesman for the Federal Government says there's no evidence that a boatload of more than 100 people left Indonesia on or about October the 2nd and he says it's only speculation that a vessel sank. PETER CAVE: David Weber reporting. THE federal government knew a boat leaving Indonesia was in peril before it disappeared with more than 100 asylum seekers trying to reach Australia. Frantic relatives have not heard from the missing for more than seven months and are demanding to know how a boat could vanish with the Australian and Indonesian governments aware of its existence. The boat left Indonesia on October 2. Australian authorities learnt a vessel was in distress the next day but Home Affairs Minister Brendan O'Connor said ''credible information'' showed its difficulties had been resolved. No details of a resolution have been offered to New Yorker Mohamad Heidari, whose search for his teenage brother has taken him to Pakistan and Indonesia. Mr Heidari, originally from Afghanistan, remains frustrated that authorities have been unable to shed light on what happened. Habib Heidari had called his brother excitedly just before setting sail with the other asylum seekers. "We were very worried when he wanted to take this boat," Mr Heidari said. "He said, 'Don't worry, it is safe.'" The Heidari family fled Afghanistan in 1999 as the Taliban homed in on their village. "I lost the rest of my family and went to Iran," Mr Heidari said. He was accepted as a refugee in the US in 2003. Habib left his new home in Pakistan for Australia. He paid $US12,000 to a people-smuggling syndicate and took the familiar route, by plane with a fake passport to Malaysia and then down to Indonesia before hooking up with a boat. "There were many people on this boat; families, mothers with children," his brother said in Jakarta. "The Indonesian and Australian authorities have told us nothing. What happened to this boat? Where did it sink? There are so many unanswered questions." Panicked calls to the agents in the days after the boat went missing were met with replies that it had arrived safely, and demands for a final payment. The money was paid but there were no phone calls or emails from those on the boat. Mr Heidari said the boat was organised by smugglers with agents in Pakistan, Malaysia, Indonesia and Australia. But the agents in Pakistan who were paid the last instalment disappeared months ago, and are believed to have tried to reach Australia. The Australian government shared information with the Indonesian government, believing the boat to be in that country's search-and-rescue zone. Surveillance by Border Protection Command, and actions by Indonesian authorities, on October 3 failed to turn up a vessel in distress. "There has been no confirmation of the alleged vessel's location," Mr O'Connor said. A SENATE committee yesterday heard that a lifeless body was spotted on a makeshift tyre raft before the Australian search for five Tamil asylum seekers off the Cocos Islands was called off. The committee heard at least one person was sighted by Australian search aircraft before a later sea search that failed to recover bodies was aborted. The Sri Lankan asylum seekers had cast themselves adrift after their boat ran out of food and water. Crew from a bulk carrier sent to the vessel's aid believe the men were taken by sharks. Yesterday, the head of Customs and Border Protection, Michael Carmody, said an Orion had seen a man from the air. "They reported a body on one of the tubes," he said. "It was motionless." A later search by the Australian Maritime Safety Authority located no bodies, he said. Australian authorities first became aware the Sri Lankan boat was in distress after a passenger's friend called the Australian Maritime Safety Authority from London. Customs often received tip-offs from people overseas when boats failed to arrive at their intended destination, Mr Carmody said. But unlike the May incident, another boat missing since last October never reached Australia's search and rescue waters and contact was not made with the boat directly. In that instance, Customs says it did "everything it could possibly and reasonably do", Mr Carmody said. That people-smuggling venture left Indonesia with more than 100 asylum seekers and was unusually large, he said. "I can't be sure what happened. The boat might have gone back to Indonesia, it might have sank," Mr Carmody said. Follow-up interviews by immigration officials on Christmas Island unearthed no evidence that any passengers survived. The activist Hassan Ghulam said he had received calls from worried relatives in Kandahar, Quetta, Kabul and Bamyian. Others had called from the US, Canada, Malaysia and Indonesia, he said. "It is not acceptable for Customs to say it does not know what happened," he said. "If there is sad news, the families must be allowed to make funeral preparations." The Home Affairs Minister Brendan O'Connor said the journey underlined the dangers of taking a risky boat passage. An air patrol did not detect any boat in distress, he said. Senior government officials have privately conceded that a refugee boat that disappeared late last year en route to Australia probably sank, resulting in the loss of more than 100 men, women and children. Speaking to a Senate estimates committee, Customs and Border Protection chief Michael Carmody said authorities had "credible information" the boat set out for Australia from Indonesia about October 2 last year. The boat, if it existed, has not been seen since. Mr Carmody said it was possible the boat had returned to Indonesia. But privately officials have told The Australian it is far more likely the boat sank, resulting in the loss of all aboard. Relatives of those on board the vessel have so far heard nothing, suggesting those on board are dead. Mr Carmody said the boat was last thought to be within the Indonesian search-and-rescue zone, although its precise location was not known. Mr Carmody said the Australian Maritime Safety Authority was told about the boat. AMSA, in turn, notified Indonesian authorities, who unsuccessfully searched for it. There is no suggestion authorities, either Australian or Indonesian, were negligent in their attempts to assist the vessel. Mr Carmody said Australia had passed on all information about the boat to Indonesia. He said Australian authorities had interviewed asylum-seekers on Christmas Island seeking information on the boat. Fears are held for at least five asylum-seeker boats that have set sail from Indonesia for Christmas Island since 2008 but are missing. A sixth boat ferrying asylum-seekers from Malaysia to Indonesia in 2008 was believed to have sunk with the loss of 86 lives, said Afghan Hazara community spokesman Hassan Ghulam. Of the six boats whose fate was unknown, most interest was centred on a vessel reportedly carrying 105 passengers that departed from near Jakarta in early October last year, Mr Ghulam told The Australian. The traditional wooden boat went missing in heavy seas within days of leaving port. Mr Ghulam said relatives reported receiving panicked telephone calls from passengers. "They were in telephone communication with a smuggler named Hijaz. "On the second day, they (passengers) called and said the sea is very rough -- what should we do?" he said. The boat's Indonesian captain is alleged to have warned that seas were too rough to turn the boat around so Hijaz is said to have reassured passengers that it was all right to proceed with the voyage. The boat never made it to Christmas Island and Mr Ghulam said he had received several inquiries from relatives about its fate. Pamela Curr, from the Melbourne-based Asylum Seeker Resource Centre, said: "I've had a number of emails from Malaysia and Holland, from people looking for relatives." Mr Ghulam said that in 2008 another boat carrying Afghan asylum-seekers from Malaysia to Indonesia sank and at least 86 people perished. The fate of three small boats, which set off for Christmas Island from Indonesia carrying between six to 10 passengers, was also unknown, he said. As tensions continued to run high among detainees at Christmas Island yesterday over the wreck of the boat carrying up to 100 asylum-seekers on Wednesday, Immigration Minister Chris Bowen was asked to respond to claims by the UN refugee agency's regional representative, Richard Towle, that Australia's immigration detention system was clogged with rejected asylum-seekers. "I don't think, in fairness, that is exactly what he said," Mr Bowen said, defending the government's "very robust returns policy". "We have seen rejection rates increase over recent months; that takes some time to flow through the system in terms of returns." In the first week of October 2009, a tired, rotting boat chugged into the ocean along the south of Indonesia, heading for a piece of Australian soil. It was heavily laden with Hazara families; 105 people leaving unspeakable things behind them. Nekbakht and her two boys, Reza (10) and Abbas (7) were among them. Five years previously, Nekbakht's husband had been killed by Taliban, along with their three daughters and two sons. Reza and Abbas were all that were left in Nekbakht's universe. She sold everything she had and fled Afghanistan in pursuit of a future for her sons. When I met her, Nekbakht's exhaustion and despair were etched unmistakably on her face. Jaffar, 17 years old, travelled with his brother Mukhtar (13) to Indonesia without their parents. They had only each other. They asked me - quietly, unobtrusively - to help them come to Australia. I told them that despite being sick with frustration and powerlessness, there was nothing I could do to help them. Golafroz, 45 years old, lost her husband and two sons to the Taliban. She fled Afghanistan, and spent four months in an Indonesian prison with her only remaining son, Sajjad (17). When I met her, she clutched me, kissed my hands, wept into my shoulder and begged for my help, and God's. She pleaded with me to find a way for her to reach Australia. In the course of one of the hardest conversations of my life, I told a sobbing widow there was nothing I could do to help her. That boat - and its passengers - never reached land. Reports suggest that Australian officials received terrified calls of distress as the boat disintegrated in a dark ocean. I have since received calls from families in Australia, Indonesia, Pakistan, Afghanistan and Iran, desperately seeking information about their missing loved ones, and begging me to dispel their worst fears. I clearly cannot. Nekbakht and her boys, the young brothers Jaffar and Mukhtar, and Golafroz and her son Sajjad perished in their pursuit of freedom. These were people so vulnerable, so haunted, so desperate to find safety that they were willing to die trying. That truth - and the echoed pleas of these women and their sons - should pierce the minds of our policy makers, and should inform every last minute detail of Australia's approach to asylum seekers. A ship with 97 people on board left Indonesia for Australia 175 days ago but there has been no contact with it since, writes Natalie O'Brien. 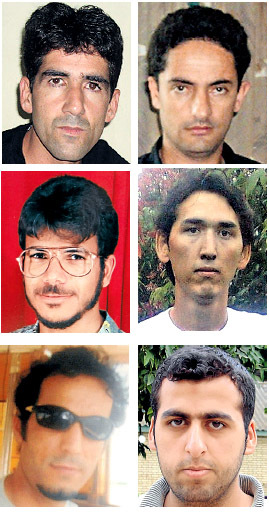 Six photos: Some of the missing ... (clockwise from top left) Abdul Wadud Rahmani; Abdul Hai Rahmani; Hamed Ebrahimi; Ali Hussein Enayat Bakhsh; Zeiaullah Sediqi; Ahmad Othman. Shafiqua Hamid last spoke with her brother Abdul Hai Rahmani on November 13 last year. He, his cousin Abdul Wadud Rahmani and friend Zeiaullah Sediqi were on an Indonesian boat about to set out for Australia. In that conversation, her brother told her the boat was due to leave in 15 or 20 minutes. "He has called me from the boat and told me that he feels a bit sick and that there are many families with children," says Hamid, who now lives in Germany. Abdul told her he had been staying in Jakarta while waiting for the boat to be arranged and had given her the Indonesian mobile phone number of Pakistani people smuggler Mohammed Ali, who arranged his trip. That was the last she heard of him. She tried to make inquiries but was told that "he is probably in Australia now and that he is also accepted". Hamid has since tried calling Mohammed Ali, but the number has been disconnected. Today will be 175 days since there has been any contact with them and the 97 people thought to have been aboard that boat. The Sun-Herald first raised the alarm about the missing boat in December, after worried relatives began calling advocates in Australia trying to find out if it had arrived. Those on the boat had promised to phone when they reached Christmas Island. The Department of Immigration gives all new arrivals access to phones to let their families know that they are safe. I really worry about my son ... he is just 17. Please help. Kareem Othman, who lives at Blackett in Sydney's north-west, has been waiting for news of his brother Ahmed Hadadd Mohammed Othman. He has rung every detention centre in Australia. His brother, 43, who is married with four children, was last heard from on the same date as the others. Also desperate for news is Umm Hamed, the mother of 17-year-old Hamed Ebrahimi from the Daykundi province of Afghanistan, who was also on the boat. Every few weeks, she emails this newspaper. "I really worry about my son ... he is just 17 years old and he is so young. I can't help crying please help me," she writes. "Life was bitter for me. I cry day and night. Please help me. "Any information that you have the fate of them tell me. Azita, an Iranian woman now living in Melbourne, has been waiting for her childhood friend Mohammed Rezai. He, too, told her he was on his way to Australia and leaving on November 13. She says he was to call her when he arrived at Christmas Island. The call never came. From what The Sun-Herald has been able to establish, it seems the boat had a mix of Iranian, Iraqi and Afghan asylum seekers. The stories are consistent regarding the last time the asylum seekers were heard from, November 13, and the names of the smugglers involved: Lais from Algeria; Anwar Makasar from Indonesia; an Iranian called Ali Kurdi or Ali Hamid; and three middlemen from Pakistan, Mohammad Ali Chotay, Abdul Sendi and Ismail. Sydney lawyer George Newhouse wrote to Minister for Home Affairs Brendan O'Connor, asking for help on behalf of the families. O'Connor wrote back, saying "neither Border Protection Command nor the Australian Maritime Safety Authority have any information relating to a venture that matches the details provided in your correspondence". His office did not offer to make any inquiries with other agencies or to raise the matter with Indonesia. The United Nations refugee agency UNHCR has been similarly unhelpful. The office has not responded to requests for an interview or for help in raising the issue of the missing boat. Greens senator Sarah Hanson-Young says she is troubled that after six months there is still no updated news from Australian or Indonesian authorities. She says this would undoubtedly cause anguish to the family members who already fear the worst. Ms Hanson-Young says the case showed the government "cannot have it both ways on its approach to asylum seekers". "The Prime Minister has repeatedly said there must be a regional answer to a regional problem. For that to happen with the problem of people movement, especially of those seeking asylum, cases like these need full and rapid responses from Australian authorities together with our regional neighbours. Buck passing cannot be used to simply suit authorities at the time." Asylum-seeker boats, known to the Customs and Border Protection Service as suspected irregular entry vessels (SIEV), usually take between two and four days to reach the waters around Christmas Island from Indonesia. Government statistics show that there was a boat that arrived in Australia on December 2 with 97 people on board and three crew. But it was not the same boat. Investigations into the whereabouts of the missing people have included the circulation of photographs and names to the Department of Immigration, refugee advocates and people still in detention centres throughout Australia. The Sun-Herald made inquiries in Indonesia and also asked the International Organisation for Migration there to check if the missing people had been arrested or detained in Indonesia. "Unfortunately those names are nowhere to be found," said Jihan Labetubun, the organisation's information officer. In previous cases in which asylum seekers have been arrested in Indonesia, they have been able to get word to their families. A source at the Red Cross in Australia says it is concerned. "These missing asylum seekers are mothers and fathers, sons and daughters, aunties and uncles, and their families - who are thousands of miles away - are understandably desperate for news of their fate." "We hope the government and its agencies, such as the Department of Immigration and Citizenship, Australian Customs and Border Protection and the Australian Maritime Safety Authority will use all the resources at their disposal and take all the necessary steps to help determine the fate of the boat and its occupants." The fate of the missing vessel was brought into focus in December after the shipwreck on Christmas Island of the boat known as SIEV 221, in which about 50 asylum seekers died. Many of their bodies were lost at sea. There have been previous tragedies involving asylum seekers, including in November 2009 when a boat capsized 350 nautical miles north-west of Cocos Island and 12 people were lost at sea. The worst-known tragedy at sea involved the death of 146 children, 142 women and 65 men in 2001 when their boat, known as SIEV X, sank inside the Australian aerial border-protection surveillance zone. But there may be many more cases in which the fate of the boats and their passengers remains unknown. Dr Leanne Weber from Monash University, a senior lecturer in migration policing says: "This is not the first time that boats carrying large numbers of asylum seekers have disappeared en route from Indonesia. "In October 2009, a vessel carrying 105 Afghans failed to arrive in Australia. As far as I am aware, no trace of them has ever been found. "Lives lost at sea in these circumstances are not only individual tragedies, they reflect the hidden costs of border controls." Weber says in other parts of the world, such as Europe, those attempting to count the deaths of irregular migrants at sea have estimated that only one in three bodies is ever recovered. Calls to the Customs and Border Protection Service about the missing boat have failed to shed any light on the disappearance. A statement from the service said it had not received any calls in relation to a missing boat. But the service said that even though a powerful over-the-horizon radar system had been installed on border protection boats, it was still "very difficult" to detect small, unregistered wooden vessels. But a submission to a parliamentary inquiry now under way into the December shipwreck of SIEV 221, questions whether there has been a deliberate attempt to cast doubt on the ability of the radar system. Tony Kevin, a former Australian diplomat who was a witness at the inquiry into the 2001 SIEV X tragedy and wrote a book about it, has suggested that maritime officials have tried to cast such doubts. "It suggests to me that there are people still in the system, as there was before, that don't care about what happens to the boats unless they arrive," Kevin says. "If they don't arrive they don't have to worry about it. It is a totally immoral position. We have the technology to monitor these boats, but we are only going to use it selectively." Jawad Hazara, an asylum seeker advocate and blogger who has been co-ordinating family efforts to find the missing people, has lost hope of finding them alive. He has also been involved in the search for the 105 Afghans on the boat that went missing in 2009 - nothing has been heard from them either. Hazara says as time passes and there is still no news, "theories that they have been arrested or shipwrecked, or whatever, fade away". "Based on past experiences, I believe they sank in international waters. "That is why there is no trace of them." A distress call giving out the co-ordinates of a stricken boat carrying 105 Hazaras seeking asylum, who are now presumed to have drowned, was received by Australian Customs and Border Protection officials but the agency has never publicly revealed the details. Advice that the vessel was in distress and its position in seas between Indonesia and Australia on October 3, 2009, was passed by the agency to the Australian Maritime Safety Authority, which called in the Indonesian search and rescue agency to take over the search. But the boat has never been found and those on board have not been heard from since, despite the Home Affairs Minister, Brendan O'Connor, having later said that "subsequent credible information" showed the boat's difficulties had been resolved. Customs has never revealed whether the distress call came from the stricken vessel or from another source. Shortly after the boat disappeared, frantic Afghan community members in Australia made inquiries with the Department of Immigration and Customs and Border Protection, but were told nothing about the fate of the boat. Questions in Parliament in May, which have only just been answered, reveal it was not until a story about the missing boat was published three months later, on January 18, 2010, that Customs and Border Protection "reviewed its information holdings" and found the data. Within two days of the story appearing, Mr O'Connor had been briefed. But still, the families were told nothing. The opposition spokesman for justice, customs and border protection, Michael Keenan, said "these are grave allegations about a minister misleading about what the government knew and when they knew it. A possible tragedy of this magnitude demands the fullest possible account of events. "I urge Minister O'Connor to use the Parliament this week to provide that account and to clarify the discrepancies in the comments the government have already made on this matter. If he doesn't take up that opportunity then we will look at ways that the Parliament can make the government account for everything it knows." The boat is one of eight believed to have sunk between Indonesia, Malaysia and Australia in the past 2½ years. The most recent vanished on November 14 last year with 97 on board after leaving a port near Jakarta. It is believed many more have gone missing and one may have disappeared just before the SIEV 221 smashed into rocks on Christmas Island last December, killing 50. An Iranian woman who lost five relatives in the tragedy will tell the West Australian Coroner's Court next week that when she inquired about the approaching boat Christmas Island detention centre staff asked which boat she was talking about - the one the Navy had detected or another that had gone missing. Information about the 105 missing Afghan Hazaras, a Persian-speaking ethnic group who live mainly in the central region of Afghanistan, only came to light after the opposition asked in Parliament what the government knew about each of the missing eight boats. The families of the missing Hazaras have long questioned how the boat could have vanished without trace, with two governments aware of its existence. They had no idea the government had such specific information about its distress. Afghan community spokesman Hassan Ghulam, has called on the government to release details of the distress call, who made it and any other information available. Mr Ghulam said relatives last received calls from those aboard the boat saying that they were in international waters between Java and Australia. "The last call we know about was one of the passengers saying we can see the Australian forces coming towards us. We are going to throw our mobiles overboard," he said. Mr Ghulam said the government needed to answer many questions, including whether it had any satellite or radar images of the boat. He also wanted to know whether the navy saw them, and if so, why did they not rescue them. The families of the missing deserved to know what happened, he said. "We are not blaming the authorities. People know they are risking their lives when they get on these boats," he said. "If they have drowned, then we can have a funeral and get on with things." The head of Customs, Michael Carmody, told a Senate estimates committee last year that "we did not have a precise location" for the boat, which went missing in October 2009. In his comments to Senate estimates, Mr Carmody had also said: "Perhaps this is more appropriate for the Department of Immigration and Citizenship, but there were further approaches from people requesting that we do something about this vessel and the people on it." The opposition spokesman for justice and customs, Michael Keenan, has sent a letter to the Minister for Home Affairs, Brendan O'Connor, calling for the government to clarify the incident. "It is hugely distressing to relatives of people they believe may have lost their lives to be faced with contradictory statements in the media and then to the Parliament about what the government knows," he said. But it has never been found, and those on board have not been heard from since, despite Mr O'Connor having later said that "subsequent credible information" showed its difficulties had been resolved. An asylum-seeker boat that is believed to have sunk, drowning 105 Hazaras on board, was left floundering and ''taking on water'' for almost four hours before Australian authorities activated a rescue mission. Customs and Border Protection officials admitted in a Senate estimates hearing on Tuesday that red tape was the reason for the delay in relaying the distressed boat's co-ordinates to Australia's sea rescue agency. The boat carrying men, women and children went missing on October 3, 2009, on its way from Indonesia to Christmas Island, after Australian authorities learnt it was in distress. Those on board have vanished and relatives fear they have all drowned. Questions have since been raised about what happened to the boat and what the Australian authorities knew about it. The federal opposition had called for a detailed explanation after claiming the government had made contradictory statements about what information they had about the missing boat. Details about the ill-fated boat trip only came to light in early 2010, after relatives of the missing contacted Australian authorities asking for information. They had also told the Afghan community leader Hassan Ghulam that the last time they had heard from their relatives - all Persian-speaking Hazaras from Afghanistan - was in telephone calls from the missing boat saying that they were in international waters. The federal government initially denied any knowledge of the boat. However, after a review of government files, the former minister for home affairs Brendan O'Connor admitted the government had received a distress call from the boat but also that it had received ''credible information'' the boat had overcome those difficulties. Customs and Border Protection also said that they had told the Australian Maritime Safety Authority as soon as they got the information that the boat was in distress. After questioning by Liberal Senator Michaelia Cash, Ms Grant revealed the reason for the long delay had been because Border Protection officers did not know how to deal with classified information. She said details of the distress call came from a secret source, and it took officers three hours and 33 minutes to come up with a ''set of words'' that could be used to tell Maritime Safety about how they knew the boat was in trouble and where it was. Border Protection has always refused to say how it knew the boat was in trouble because that was classified information. When the information was finally passed to Maritime Safety, the agency pinpointed the boat to be in Indonesian waters and requested Indonesian search and rescue take over the incident. But by the time Indonesian search and rescue reached the area that night, they could not find a boat in distress.